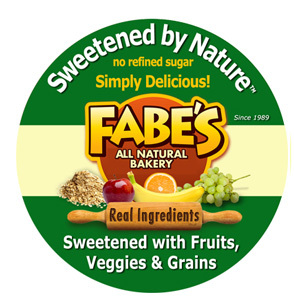 Fabe’s All Natural Bakery was founded in 1989 and was a pioneer of delicious alternatively sweetened, healthy baked goods, using sweeteners only from plants, fruits and grains as alternatives to conventional forms of sugar. Fabe's dedicated it's all natural bakery to making a gourmet line of moist and irresistible cookies, cakes, pies, muffins, organic brownies and snacks that taste as good as the less healthy, sugar-filled competition. All of Fabe’s all natural great-tasting desserts were made without refined sugar, hydrogenated oils, preservatives, artificial ingredients or any other highly processed ingredients. They were all trans fat free and most are dairy and egg free. Fabe’s All Natural Bakery prided itself on giving health-conscious consumers great-tasting desserts while also offering individuals with special dietary needs a variety of options to choose from including Gluten-Free, Dairy Free, Egg Free, Vegan, Wheat-Free, 100% Whole Grain and Organic. Fabe’s All Natural Bakery closed in 2014. They will be sorely missed. What makes Fabe's so different? Bet you thought you couldn't find a truly healthy dessert made without refined sugar that delivers a consistently delicious taste. Think again... Fabe's uses the finest quality of ingredients to achieve an unmatchable taste. If you aren't totally satisfied with our delicious desserts and snacks, we'll give you your *money back - 100% guaranteed good taste! Could sugar or gluten be dragging you down? Are you, or does someone you love suffer from fatigue, foggy brain, irritability, digestive problems or joint pain? These are just a few of the many symptoms of gluten intolerance and/or sugar overload.